The story of Siamese twins separated by a doctor on the day the were born. The brothers were then raised by different parents in order to protect them (their family was wiped out by enemies on the day they were born). Twenty years later they come back together and move to take revenge on the man responsible for wiping out their family. 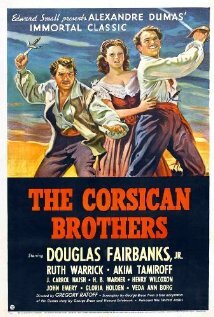 Overly soapy, and to be honest kind of dull, swashbuckler has Douglas Fairbanks Jr in the duel role as the brothers. He's quite good but he's not given a ton of to do. This is played more as a romance than as an action film so things move really slowly. Its not bad but I was bored to distraction at times. I kind of “everything you ever wanted to know about the Phantom of the Opera but were afraid to ask” look at the classic story from it’s origin, influence and stay in the theater. Full of great stories, great pictures and “oh yea” moments the film really is everything you wanted to know but were afraid to ask. Actually the film is more than you want to know since the film runs out of steam about halfway through Hugh Panero’s discussion of doing the Phantom on Broadway. What he’s saying is fine, but the intricacies of his explanation comes at the end of an exhausting (in a good way) 105 minutes and I would have zapped through the piece were it not so close to the end. Say what you will about the film it’s everything a Phantom lover could want to know. This is my final Film Diary post. Tomorrow we begin our move toward this years New York Film Festival with a week of New releases.